Elgar Advanced Introductions are stimulating and thoughtful introductions to major fields in the social sciences and law, expertly written by the world's leading scholars. Designed to be accessible yet rigorous, they offer concise and lucid surveys of the substantive and policy issues associated with discrete subject areas. The Post Keynesian approach to monetary and fiscal policy, incomes and the environment is also summarized, with particular attention being paid to controversies over austerity and the reform of the financial sector and international monetary system. The Global Financial Crisis of 2007-2008 is used as a case study to illustrate many of the significant theoretical and policy questions raised in previous chapters. 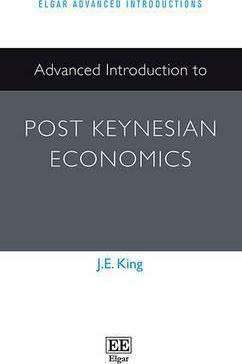 The relationship between Post Keynesian and other branches of heterodox economics are explored, and the book concludes with a brief discussion of the future prospects for the Post Keynesian school.